The car rushes on the road crossing the valleys which mark the border between Georgia and Armenia. I and Angeliki, my girlfriend, left on a private car from Tbilisi headed to Yerevan, where we arrive after a 4-hour drive. Our first impression of the Armenian capital is not that positive: chaotic traffic welcomes us in the decadent, dull outskirts bearing the signs of Soviet suburban expansion. Once we cross this grey curtain, Yerevan reveals itself as a surprisingly lively city. 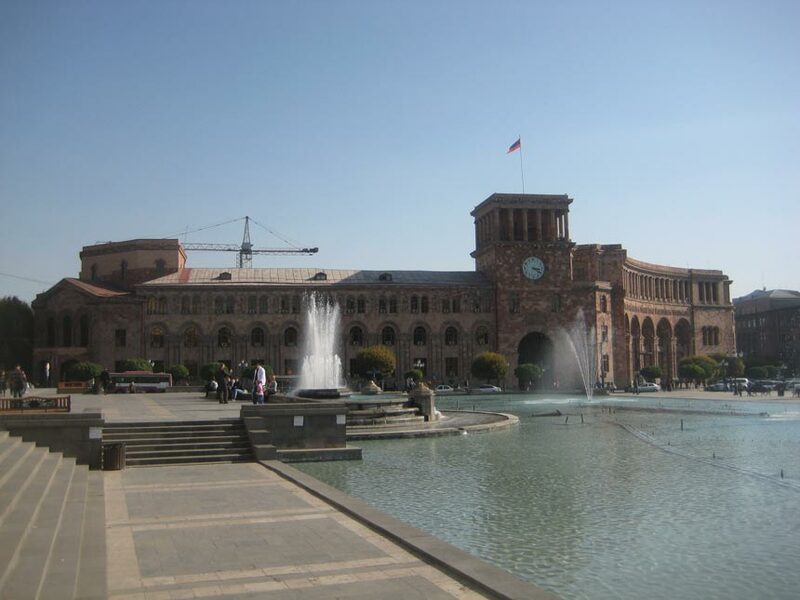 Downtown Yerevan was widely rebuilt in Soviet times according to the neo-Classical urban planning model of other European capitals, with wide tree-lined boulevards converging with geometrical accuracy in great squares and parks. Perhaps it’s because of this that as we walk down the avenues of the centre, lined with fine 19th century buildings, restaurants and shops, Angeliki tells me “It feels like being in Paris”. This impression gets even more vivid in front of the imposing Opera House, surrounded by a big park full of outdoor cafes. Republic Square, instead, is one of the best examples of Soviet squares, a huge open space delimited by hulking buildings. Designed to convey a sense of grandeur, Angeliki and I agree that it looks a bit megalomaniac. The rosy colour of these and many other buildings give Yerevan the nickname “Pink City”; while according to another theory the epithet derives from the joie de vivre of its inhabitants. 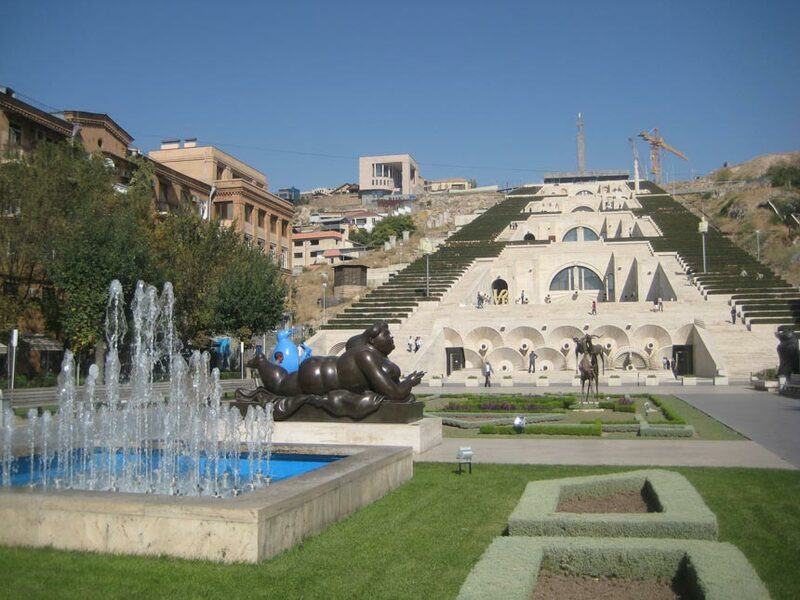 Yerevan’s cultural scene is incredibly rich. There are dozens of museums and places of interest to visit, but unfortunately due to our limited time, we have to pick the best ones. 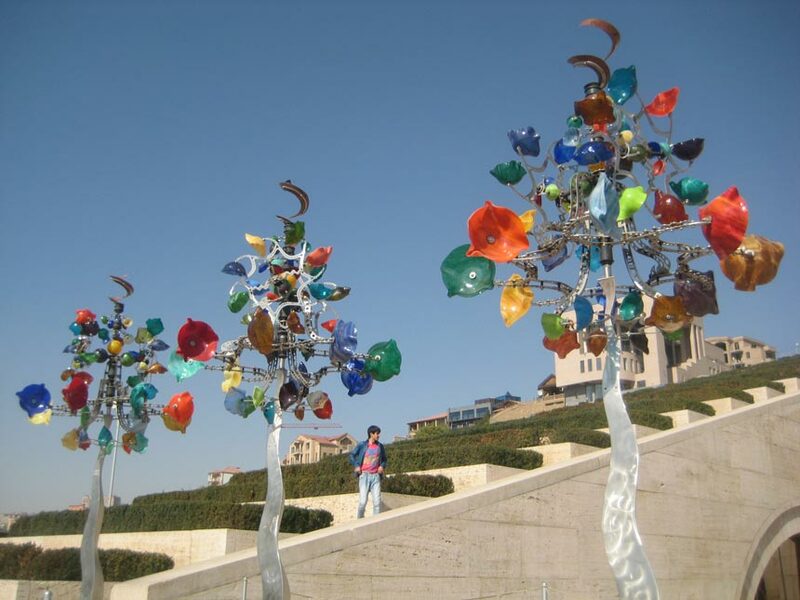 The Cascade complex, a huge flight of stairs decorated with beautiful flowers, fountains and artworks is surely one of them. Built in the hillside on several levels is also the Cafesjian Center for the Arts. The Cascade is truly a visionary place, a mix between the hanging gardens of Babylon—or, less ambitiously, Rome’s Spanish Steps—and the Guggenheim Museum. Climbing the endless steps, we reach the top of Victory Park, where, sitting in the shadow of the Mother Armenia colossal statue, we enjoy a magnificent view of the city. Next to the Cascade lies an attraction that two culture-vultures like us certainly cannot miss. 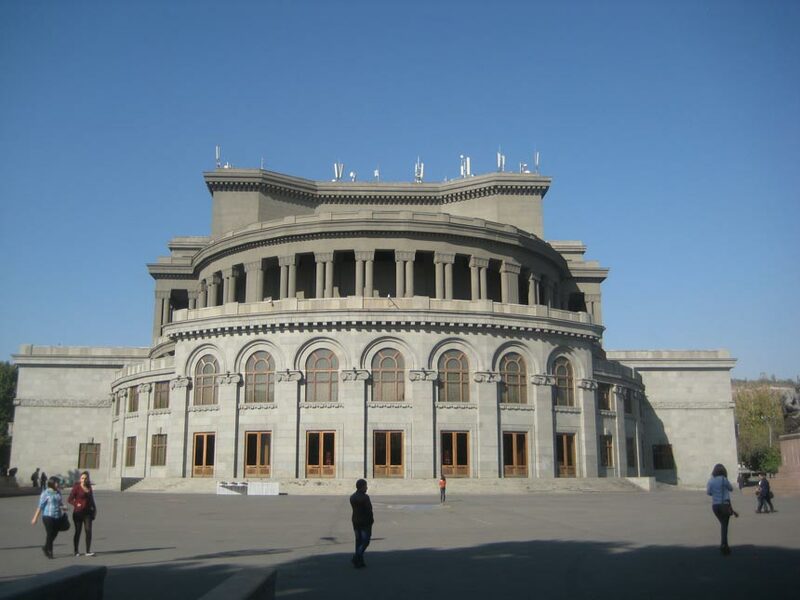 It’s the Matenadaran, a massive museum in which thousands of medieval manuscripts in Armenian and other languages are exhibited. 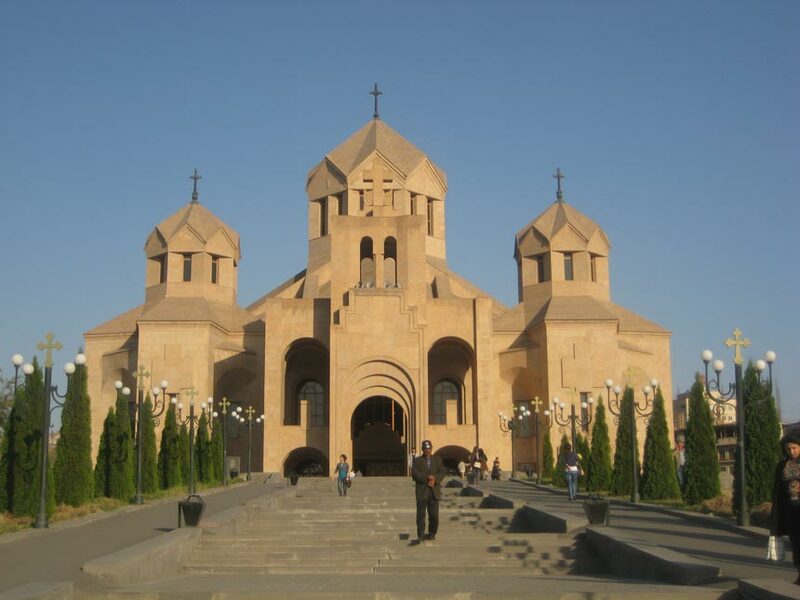 Due to the secularization process imposed by the Soviet regime, only a few religious temples survive in Yerevan. Curiously enough, there are more Armenian churches in Istanbul, where we live, than here. The only church we manage to visit is the gigantic—although little graceful—St. Gregory the Illuminator Cathedral, built in 2001 to celebrate the 1700th year since the conversion of the country to Christianity. St. Gregory the Illuminator Cathedral. “It’s evident”, I comment, “size really matters to Armenians”. While it’s not possible not to spot the cathedral, we struggle to find the Blue Mosque, since it is hidden in a quiet garden-courtyard. 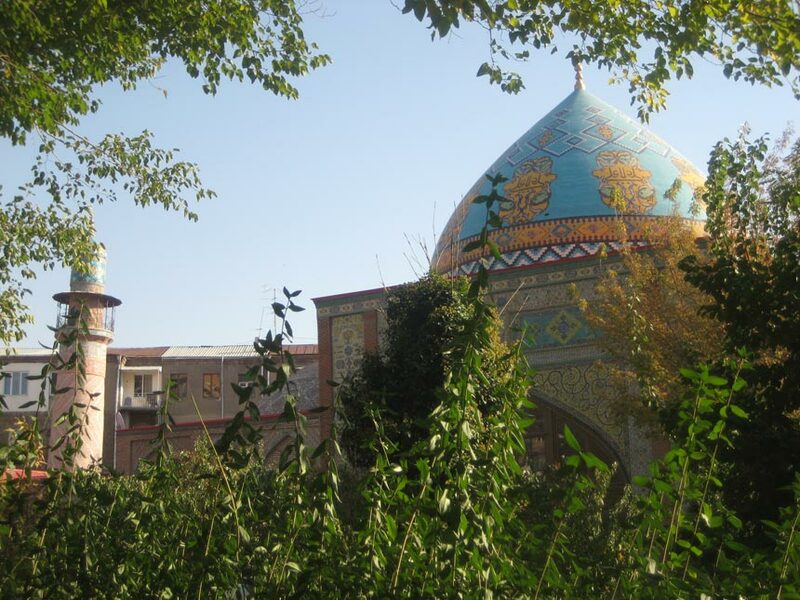 With its minaret and dome coated with brightly coloured tiles, this monument seems to have been borrowed by neighbouring Iran. Our tour ends in the Armenian Genocide Memorial and Museum, located on the top of a hill overlooking the city. Here a small group of visitors gathers silently around the severe monument. A lady leaves a red flower near the ever-burning flame in the middle. In the soft light of dusk, which makes the atmosphere even more melancholic, stands out the profile of Mt. Ararat, looming over Yerevan’s concrete jungle. In little more than half-an-hour we reach Khor Virap, the first of a long series of monasteries that we will encounter. Just like most of the buildings of its kind in Armenia, Khor Virap is encircled by walls and rises on a barren hill, given that back then monasteries served also military purposes. The unique characteristic of this place is its spectacular position at the foot of Mt. Ararat, almost on the Turkish-Armenian border; a line that nobody is allowed to cross. The sight of Khor Virap in the background of towering snow-capped Mt. Ararat is one of most iconic images of Armenia. 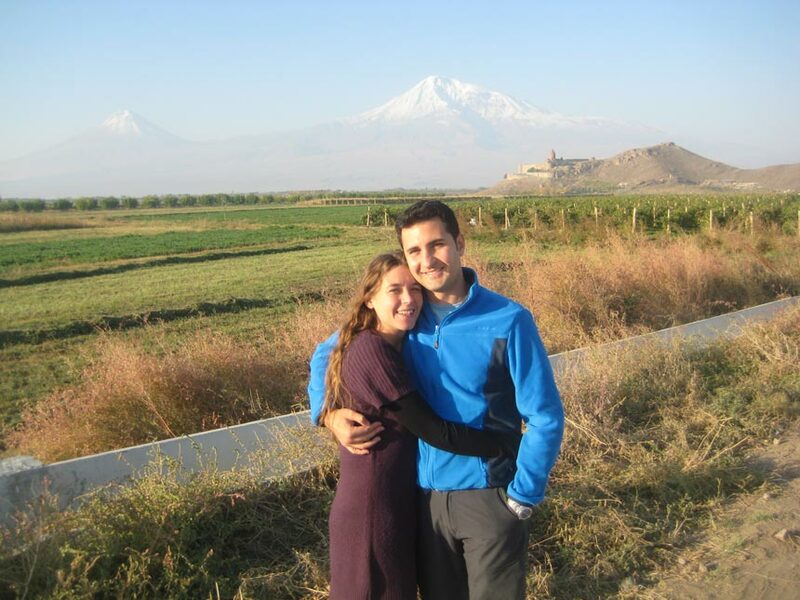 Dario and Angeliki standing before Khor Virap and Mount Ararat. We keep heading South for many kilometers, driving through moors and mountain reliefs where not a soul dwells. Sometimes, next to a stream or a green patch in a valley we spot a few villages of little pitched-roof houses like Areni, renowned for its wine production. After getting lost in the middle of nowhere, we manage to find the road to Noravank, a monastery rising in a narrow gorge, virtually secluded from the rest of the world as befitting the intentions of its founders. The structures here have the same reddish colour of the local rocks and nearly merge into the landscape. 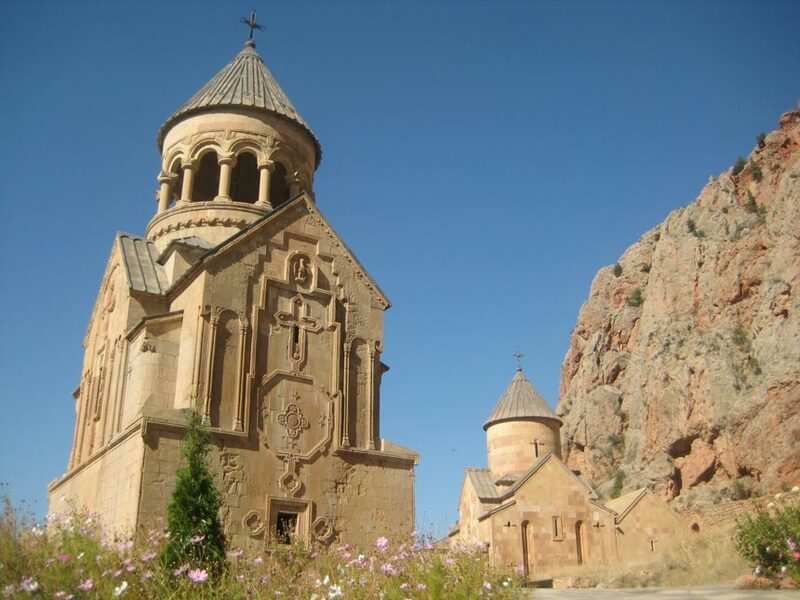 We roam the area admiring the ancient churches and a multitude of khachkar (Armenian cross-stones), carved with exquisite motifs. The desolation surrounding us makes it hard to believe that this place was once an important centre of power and residence of the Orbelian princes, who now rest in their splendid tombs. Landscapes of Armenia and Noravank Monastery. 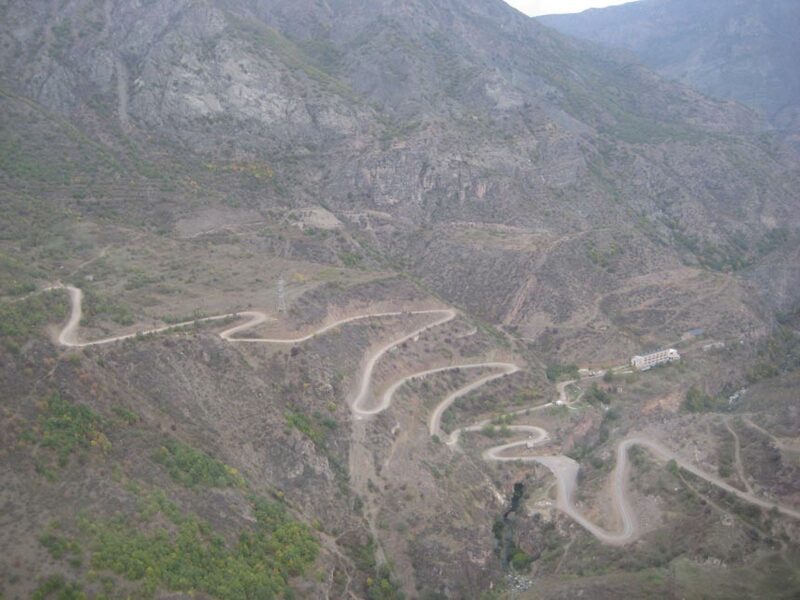 Hard to forget is our journey on the Wings of Tatev, one of the longest cable-ways in the world (5,7 km), which connects the town of Halidzor with the village and the monastery of Tatev. While flying over the Vorotan river gorge, we have the time to appreciate the panorama and marvel at the road that winds its way through the valley like the wire of an unravelled ball of wool. The monastery is perched on a plateau with its thick walls running along the edge of the cliff. Today the temple-fortress is enshrouded by a profound peace, yet when I look at and touch these old stones, images of monk-warriors who spent their austere lives here praying and fighting come into my mind. Wings of Tatev over Vorotan River Gorge. Goris, the city where we overnight is in the south of the country, a mere stone’s throw from Iran. The hotelkeepers don’t speak a word of English, only Armenian and Russian, confirming our assumption that international tourists are a rarity here. The following morning we explore the nearby Old Khndzoresk, an ancient settlement made up of hundreds of caves dug into the tuff cliffs of a steep gorge. Quite incredibly, people lived here up to the 50s. 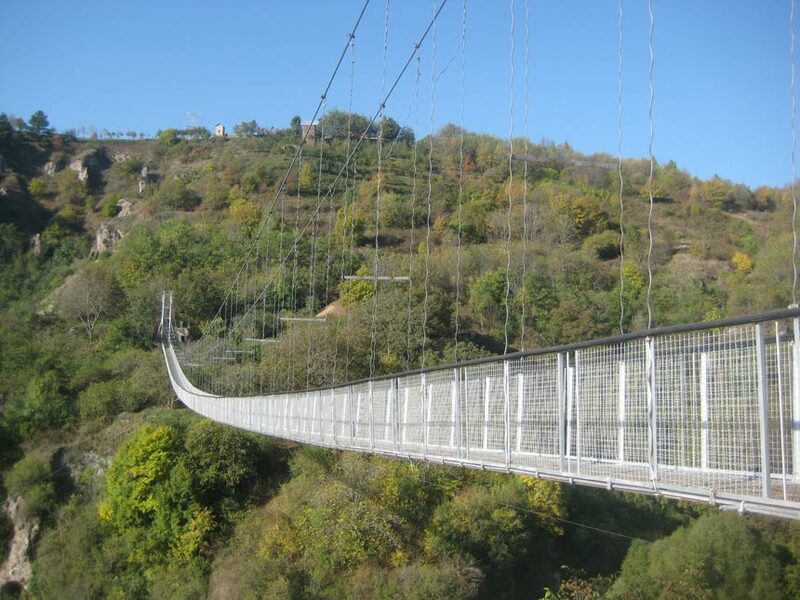 The main attraction of Khndzoresk, however, is the 160 m long swinging bridge that crosses the gorge at a dizzying height and on which we have some fun by bouncing and taking crazy pictures. Then we head north to Sevan Lake. In order to get there, we have to climb the mountains up to Selim Pass (2410 m), where we stop to visit Selim Caravanserai—built in 1332 to host travellers on this trade route—and wonder at the breathtaking view of mountain ranges spreading beyond the horizon. Although landlocked, Armenia has its “blue pearl”, Sevan Lake, the largest lake in the Caucasus. In summer it must be packed with people, but now that we drive past it, in October, it’s a haven of peace. Beautiful monasteries such as Hayravank and Sevanavank are found on the shore. The two black-stone churches of Sevanavank rise spectacularly over a rocky spur facing the lake like a terrace. Gazing at them from below, standing out in the light blue sky where the moon has risen already, Angeliki and I fantasize that they are two monks who have been turned into stone by a spell and entrusted guardians of the lake.